Experience a tranquil and relaxing break under the stars. Swap traditional accommodation to open skies and stunning views. Enjoy a Stay in Old Faithful. 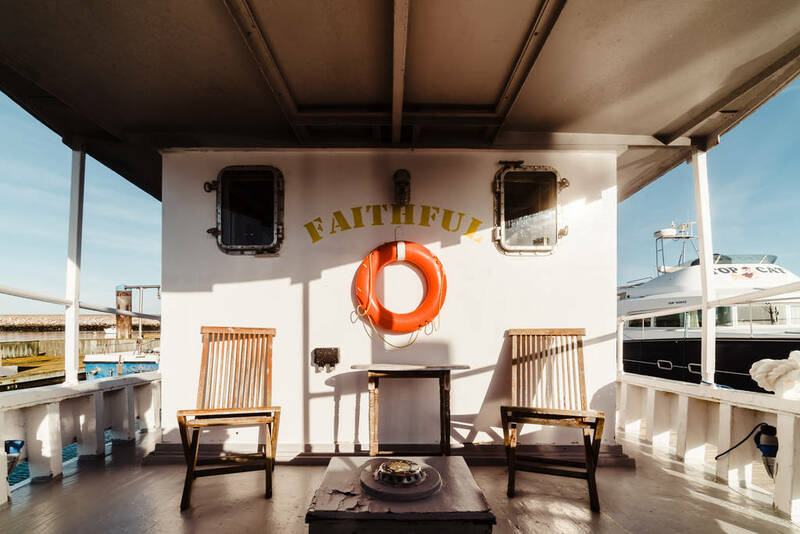 The salty sea breeze will blow away your cobwebs the moment you arrive on board Faithful. You’ll receive a warm welcome and fresh flowers and local treats will be waiting for you on arrival. Inside is relaxed and suitably littoral, with stripes, bunting and pastels aplenty. 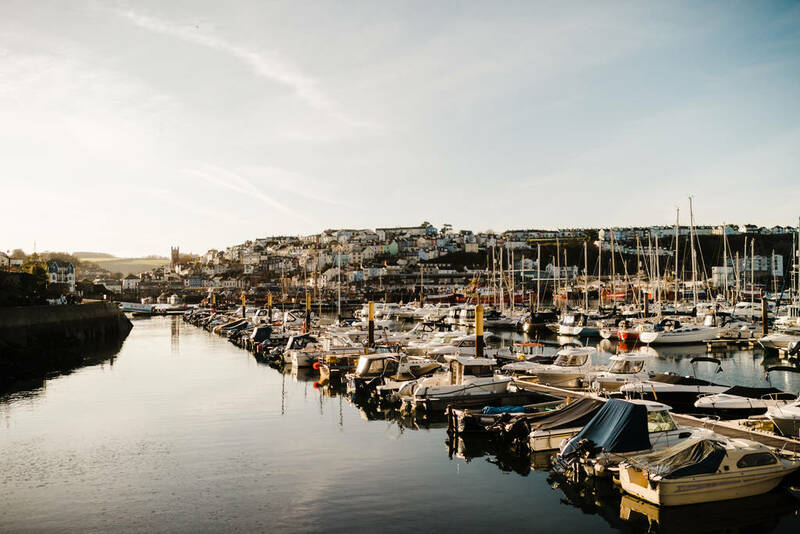 The Brixham Marina is a tranquil anchorage, but there’s plenty to watch as you breakfast on deck: the sunlight glittering on the water, passing boats and boaters, seabirds and other wildlife and distant views across Torbay. 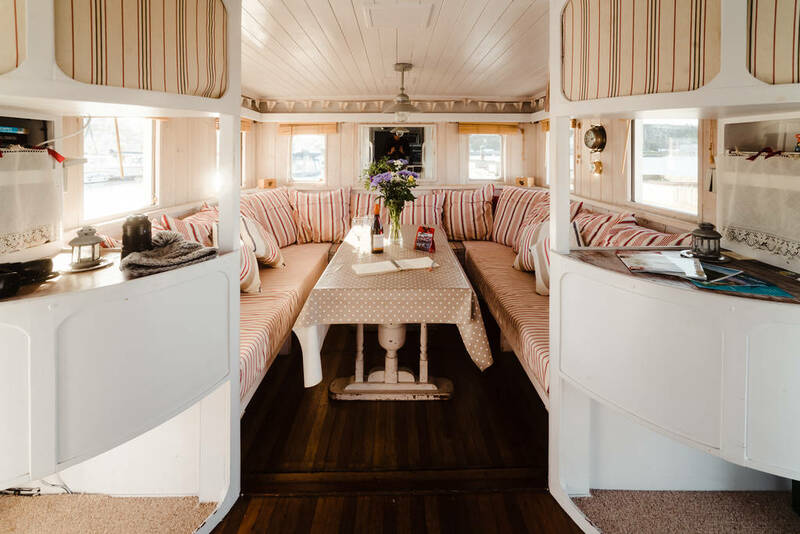 There’s a double cabin with a king-sized bed and roof window above, perfect for star gazing from your bed on a clear night as the waves rock you to sleep. 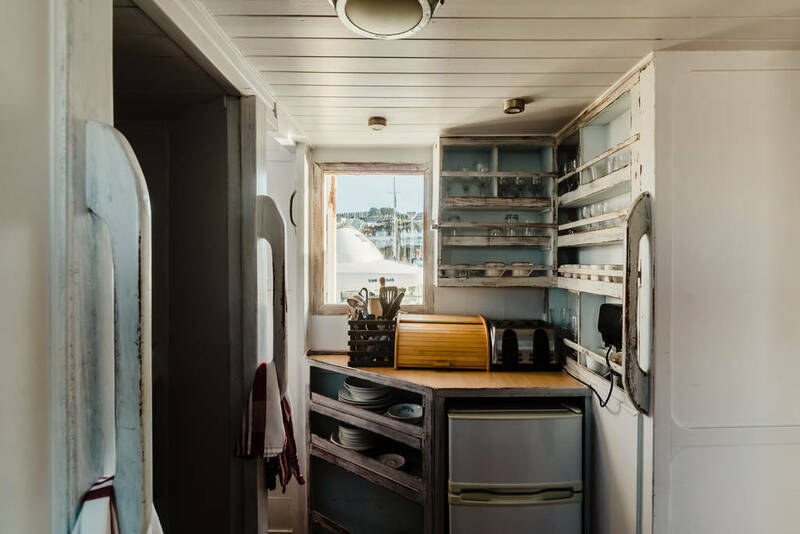 The boat is big, with plenty of room to relax in the lounge area and the fully equipped kitchen features utensils that used to belong to HMS Ark Royal, although Faithful only saw service herself as a fishing boat. There’s a proper shower on board, and you’ve also got free access to the Dart Marina Hotel in Dartmouth, with its hot tub, pool, sauna, steam room and gym. Tour Agatha Christie country by steam train, or make the most of the coast with fishing, sailing, and windswept coastal walks. Nearby Dartmouth is rich with maritime history, dotted with fun independent shops, friendly inns and wonderful fish restaurants. There are also plenty of options to hire a more mobile craft yourself, though Faithful herself stays put. 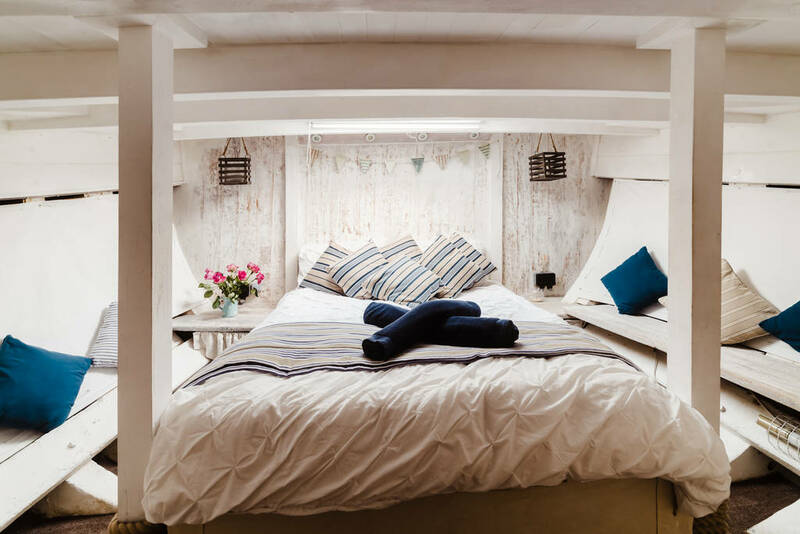 Drop anchor at any of the little coves for an adventure before you head back to your comfy double bed (down a steep ladder, best for agile folk!) for a sound night’s sleep. Visit Canopy & Stars to find out more details and book today! Evielou: Luxury by day, luxury by night. Spacious and comfortable with large windows throughout enabling you to enjoy specular views of Paignton and Torquay. If you want to experience the boating lifestyle then book a short break on EVIELOU, something different for grown-ups. Named by our two daughters, EVIELOU is a Baveria 2017 S40 Coupe, and is for a minimum of 2 nights accommodation only. EVIELOU cannot be moved by guests. Life in the busy fishing town of Brixham has always centred around the harbour, with plenty to see and do. Brixham’s history is filled with pirates and smugglers. For a romantic day out, enjoy a cruise on a heritage trawler across the bay, taking in the stunning coastline. You can see the local dolphins whilst you are out at sea! The fishing industry is thriving here, and where better to taste the fresh catch of the day than at one of the town’s many fish restaurants dotted around the harbour? Most source their fish from the world-famous Brixham Fish Market, where you’ll find more than 40 varieties of fish. 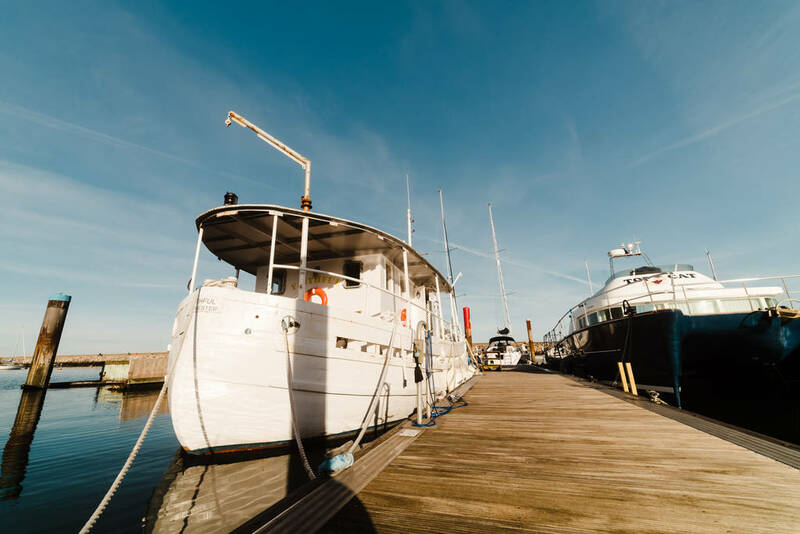 Whether you’re heading out to sea on a fishing trip, wreck diving off the coast or soaking up the local ambience in one of the town’s cosy pubs, there’s something here for everyone. Brixham Marina – the home marina of EVIELOU is one of the best marinas in the country. 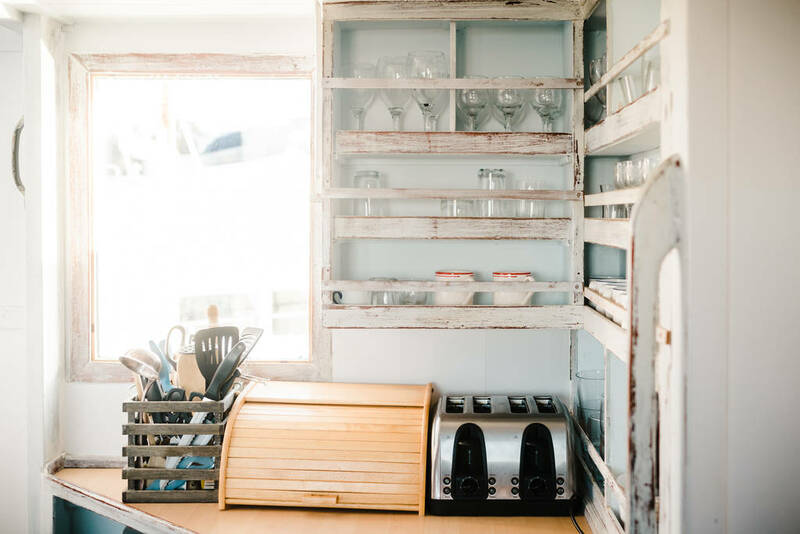 It has five star facilities including toilet block, hot showers, laundrette, coffee machine, vending machine and essential ice cubes for those Gin & Tonic lovers!! Within 5 minutes walking distance to fabulous restaurants, wine bars and many attractions. 24/7 Security to help with any problems and secure ample parking.